A three-dimensional visualization of the power produced by neutron fission in a commercial pressurized water reactor model. Large power plants—including the nuclear power plants that generate 20 percent of commercial electricity in the United States—were once designed and built to meet the predictable demands of a large customer base across cities or regions. However, energy consumers are demanding more choices, including renewable sources like wind and solar power, which provide a less predictable supply to the electric grid. Meeting periods of high power demand while maximizing the use of renewables requires a more modular approach. Small modular reactors (SMRs) could do this for nuclear energy. And like renewables, nuclear power reduces carbon emissions. Producing about one-third the power output of a large power plant, SMRs could help accelerate the commercialization of next-generation nuclear reactors by using modular construction to reduce capital costs and providing a reliable energy source that modulates with supply fluctuations on the grid. 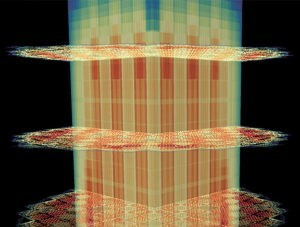 Computing simulations of SMRs are enabling their development, and exascale computing will allow scientists to integrate simulations of the particle and fluid dynamics that take place in the reactor core for more accurate predictions of SMR operations. Likewise, exascale computing can help researchers maximize the efficiency and increase the lifespan of current US nuclear reactors.